The Pro KAWASKI SX-R Steering Plate was designed to relocate (move) the handlebars forward .750”, as well as allow aftermarket 4 degree handlebars to be added which allows the rider positioning on the craft to move forward 1.5-2.5 inches further forward! The Plate also has two steering cable ball pivot locations to accommodate the allowable options on pin locations, as well as an offshore friendly setting. 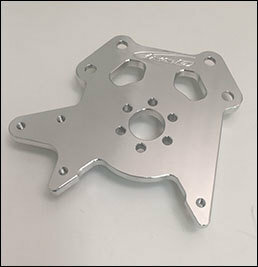 The Pro Steering Plate also has a redesigned stop system, which will allow the steering plate to be relocated 1” Forward.